Microsoft Inspire is getting closer! 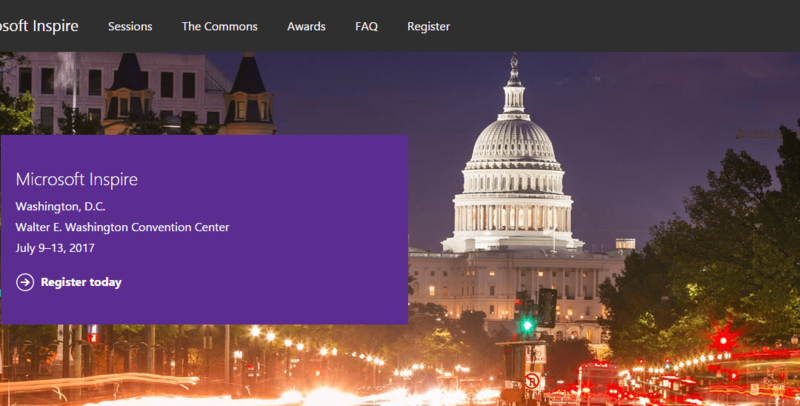 This huge Microsoft event will be taking place in Washington DC, from July 9th to July 13th. Last year, it attracted over 16000 people, making it an amazing networking opportunity for technology professionals, partner execs, and end-user companies. The keynote speakers and featured sessions have now been announced. We’re also delighted to say that the owners of 365 Talent Portal will be attending the event, so keep an eye on our blog and social media feeds for Microsoft Inspire news and updates! And of course, if you are growing headcount and would like to find and hire from over 4500 Dynamics and Azure consultants, reach out to us via Linked In or email – details below. The main themes for this year’s Microsoft Inspire conference will include digital transformation, artificial intelligence in advertising, and how to educate your workforce on IoT. If you’d like to know more about what to expect, take a look at this article on the MPN blog: 4 Reasons to Get Excited for Microsoft Inspire. The registration information, conference agenda and latest Microsoft Inspire news are all available on the official Microsoft Inspire page. The keynote speakers and featured speakers are listed on this page, where you can also find a link to detailed information about the types of sessions and content that will be delivered during the conference. On-demand videos of the sessions will also be made available so that you don’t miss anything – and in the meantime, you can catch-up on last year’s Microsoft Inspire recordings. Elena Baeva (CEO at 365 Talent Portal) and Steve Sydee (COO at 365 Talent Portal) will be attending Microsoft Inspire 2017. If you would like to have a chat with us during the conference, please email info@365talentportal.com to let us know.